Can you use hand tools? Do you understand electricity? Normal air vents will be 50-60 degrees with an indoor temperature of 70-75. You will be looking for a 18-20 degree split between the supply and return vents. Never have your Thermostat set more than 5 degrees under the room temperature. Once you reach temperature reset temperature again and repeat until desired temperature is achieved. 1. First, what exactly is working. What is not working? 2. The thermostat controls your A/C. Is the thermostat on Auto and Cool, Heat or Off. Is it set to a temperature that will send power to the A/C? Do your batteries have good voltage? If it is bad remove it from wall, label wires and remove wires. This you can take to a home improvement store and replace. Faulty thermostats account for 30% of failures. 3. Is the interior fan working? Can you feel air blowing out of the vents? Interior fans account for 30% of failures. It is best to replace the capacitor and the fan at the same time. The capacitor starts the fan. If the capacitor fails it weakens the fan motor. If the fan motor fails its best to replace capacitor. 4. Is the exterior fan working? If you have a packaged unit it will be normally on your roof? This may not be accessible without a ladder. If you have a split unit the fan will be in a unit on the ground usually on the side of the home. This will also contain your compressor and exterior coil. If your fan is not working your unit will over heat and turn off automatically. Exterior fans account for 30% of failures. You may be able to give temporary cooling by spraying exterior coil with a garden hose. These three things are the most common problems that can be repaired easily. Turn off power either with a breaker or pulling the disconnect. Once power is off label the wires and remove part not working. Take the part to a Air conditioner parts supply. They can test your part to confirm the failure. Purchase a new part and replace as old part was removed. Some new parts are a bit different. The parts supply company can advise how to wire the new part. If it is not one of these three it will be best to call a professional. Has your A/C stopped cooling but your fan is still blowing. The indoor coil may have frozen. If so change your air filter and turn only the fan on for 20 minutes. it will recirculate the air and thaw the indoor coil that may be frozen even in 100+ conditions. Most likely you need to clean your indoor coil. Do not turn your A/C on lower than 78 if your having problems. You could do more damage by having it try to work and over heat. It may even be best to turn it off completely until repaired. Heater Furnace Cycling? check and clean flame thermocouple. Air Supply refers to air entering your home from the air handler. Air Return refers to air exiting the home and traveling to your air handler. Package units are usually on the roof. 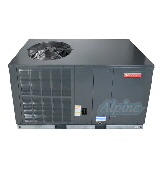 Split systems have the air handler in the attic or garage and the compressor outside on the ground.